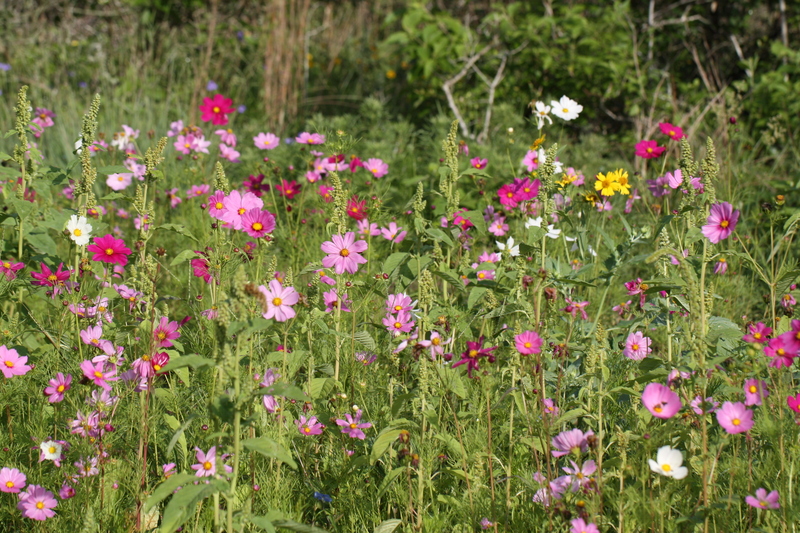 Many native plants as well as drought tolerant ones are available to use when planting your own butterfly garden or just to have a small blooming area of joy right outside your window. 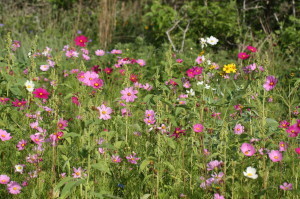 We planted several colors of Cosmos and Zinnia. In addition, we now have native wildflowers growing up in among the planted seeds, none of which have been disturbed by the deer. This little garden has been blooming for a couple of months now and has been enjoyed by the butterflies, bees and humans alike. Why don’t you give it a try and see what you can grow, too! “You scream, I scream, we all scream for ice cream!” (Jean Herring) So you’d better be at ORWMA’s Annual Ice Cream Social! Bring your favorite flavor of ice cream or sherbet. ORWMA will supply rock salt and ice. If homemade ice cream isn’t in your area of expertise, bring a toipping to share or a dessert (cookies/cake). We will have a contest for: 1) most unusual flavor, 2) personal favorite, 3) creamiest & 4) best presentation. So bring a lawn chair, your ice cream or sherbet or topping/dessert to Lynne Bigelow’s backyard (1287 Oakridge Road) at 6 PM on Saturday, July 20. 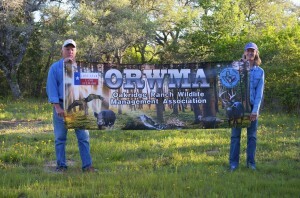 We will also introduce our new website under construction at http://orwma.org. All of Oakridge is encouraged to come and if friends/family are visiting, bring them as well. Larry Petter, President and Barbara Mitchem, Secretary/Tresurer proudly display our new ORWMA banner at the Spring Shrimp Boil! This cute little honeybee sized guy is among the many species of Robber Flies, but this Bee Fly Diptera: Bombyliidae is another family of flies. 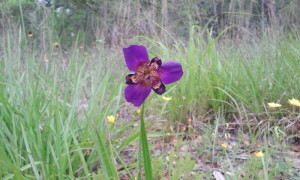 When he is not on cameras, he can be found checking out the pollen of the flowers, and on the ground. 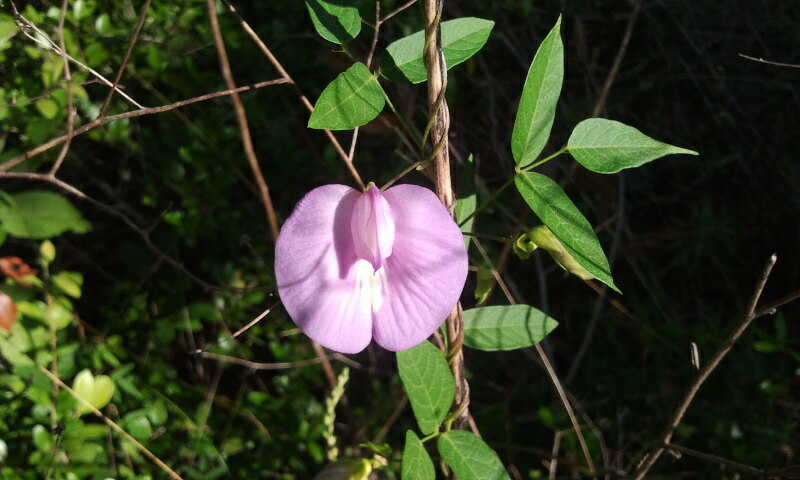 This species lays its eggs in soil and takes a year to complete the life cycle. The larvae are parasitic on immature stages of other insects and therefore is considered beneficial. Reviewing pictures we have taken, I found a shot of the bee fly building his burrow in the ground. 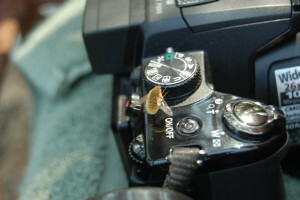 I did not realize until recently, what the identity of the insect was. 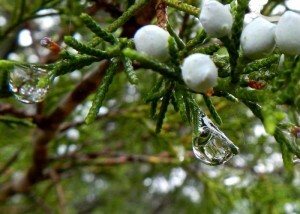 We got some much needed rain at Oakridge Ranch over Memorial weekend. 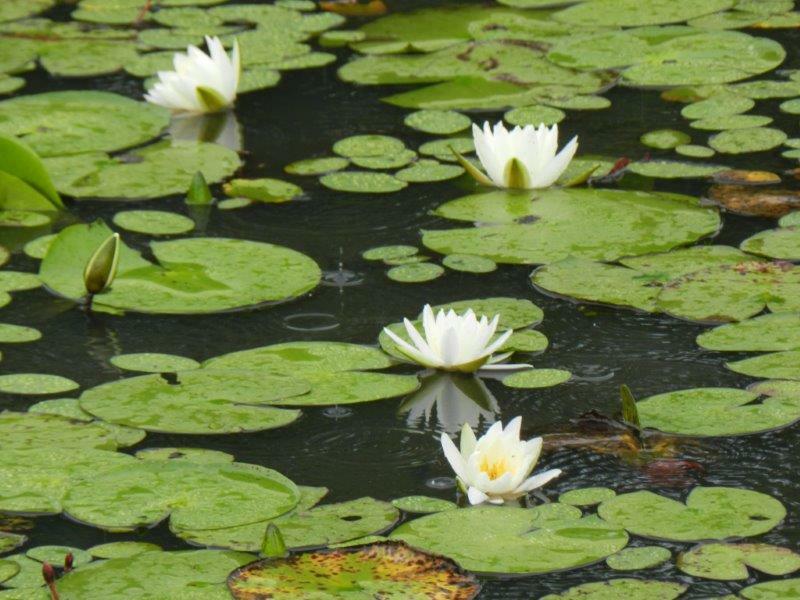 If you’re driving Miller Creek Loop, you will find these water lilies as we did last Saturday in the rain. 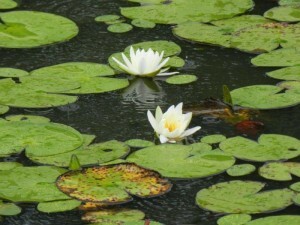 White Water Lily, Fragrant Water Lily, Nymphaea odorata. 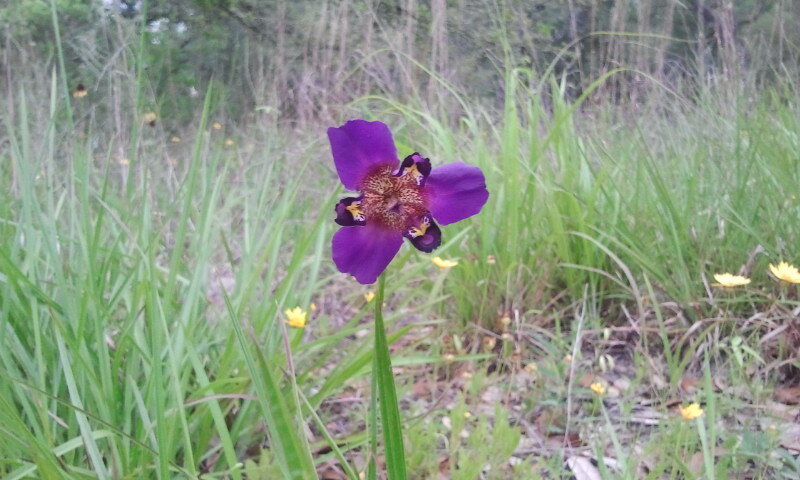 These perennial lilies are native to Texas and only become a problem if they become too thick within their environment . 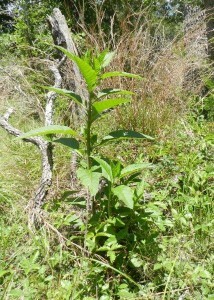 Then there is a risk they will start to shade out other plants. 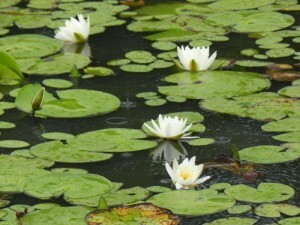 These lilies are found in our ponds, lakes, slow streams and ditches. The plant parts and seeds benefit waterbirds and small mammals. 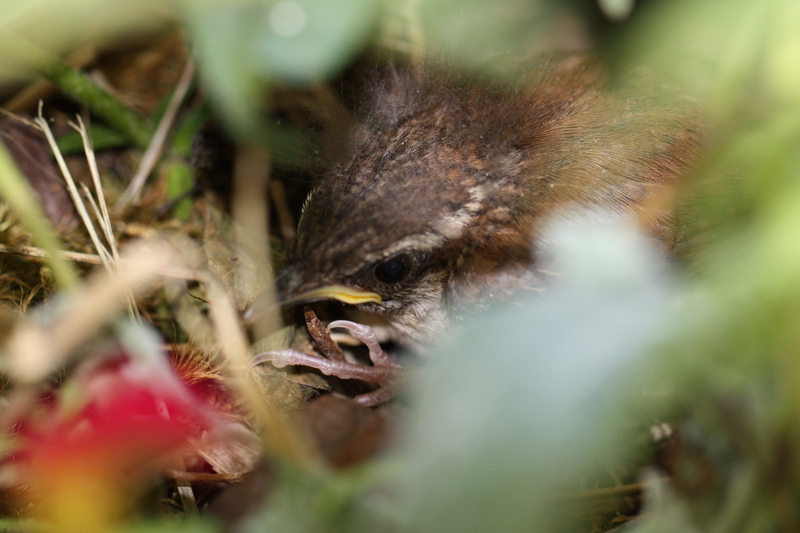 Little Carolina Wrens are ready to leave the nest at 12-14 days after hatching. These little ones are just about ready to fly! Today is day 12 and we are watching them as they move halfway in and halfway out of their nest. 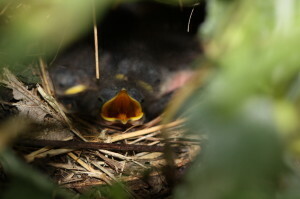 Sure hope these little birds reuse this nest soon! 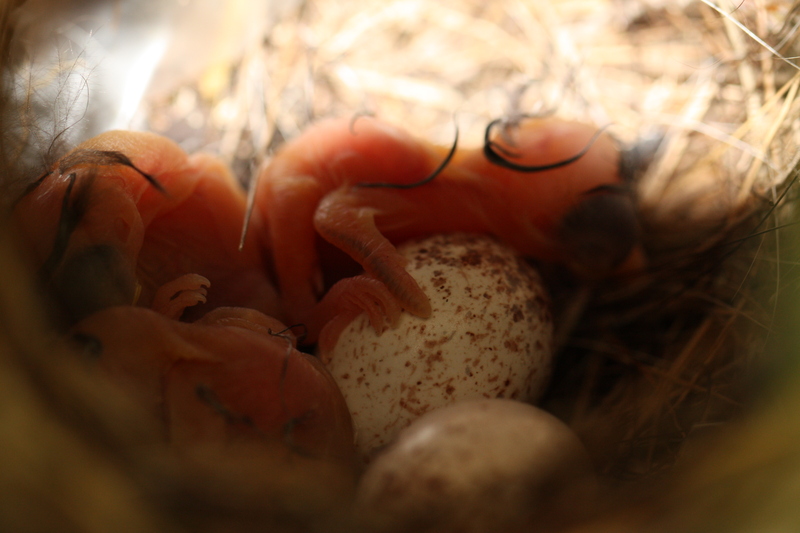 Almost a week old, all 5 hatchlings are still doing well (see below). Mr. Carolina Wren (the dad) brings food to Mrs. Carolina all throughout the day. 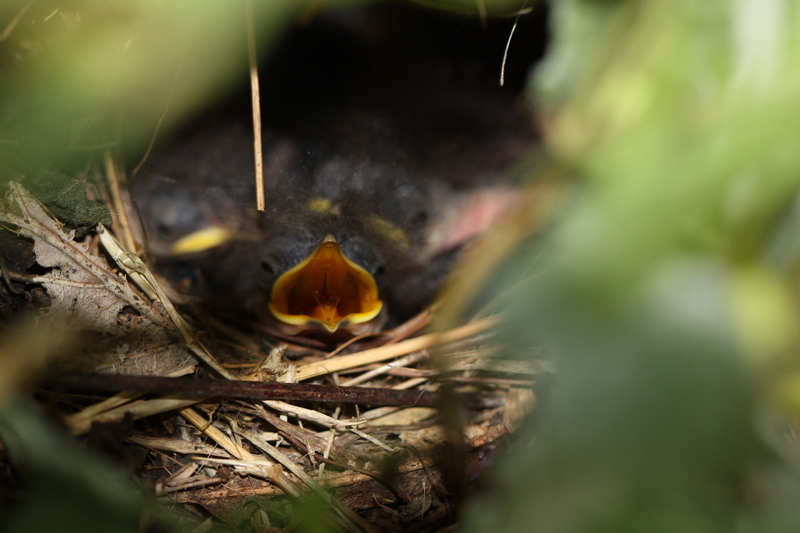 These little ones open their mouths when my camera nears thinking food is on it’s way in! 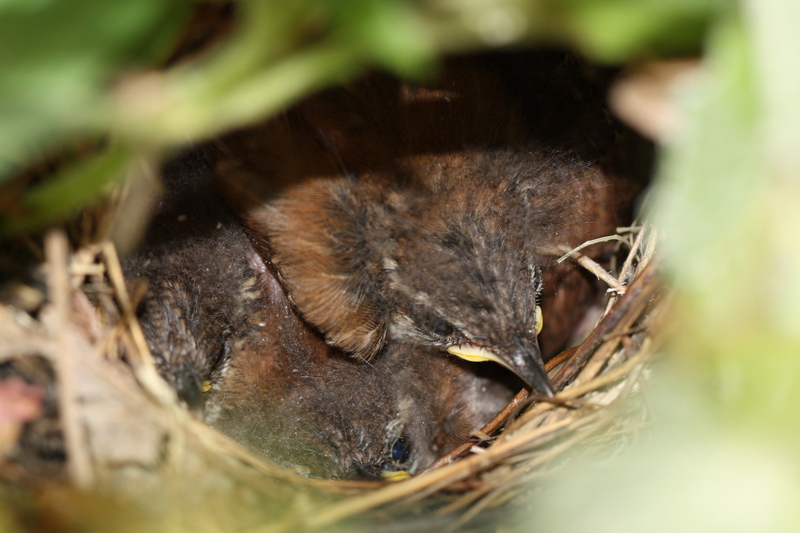 One week old Carolina Wrens; Photo by B.LaVergne, May 30, 2013. The Carolina Wren is an industrious little bird and a noisy one, too! They have a loud song for such a small bird. The male & female are similar in color & markings, only the male is slightly larger. Male Carolina Wrens work vigorously to build several different nests at the same time. These little guys are tireless! 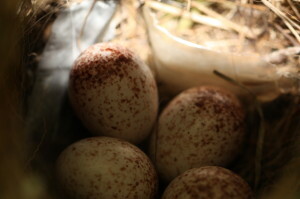 But when it comes time to actually lay eggs, the female will chose which nest she wants. 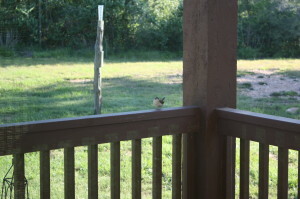 Below is a picture of the male wren as he works building his nest in a flower cart on our porch earlier this month. 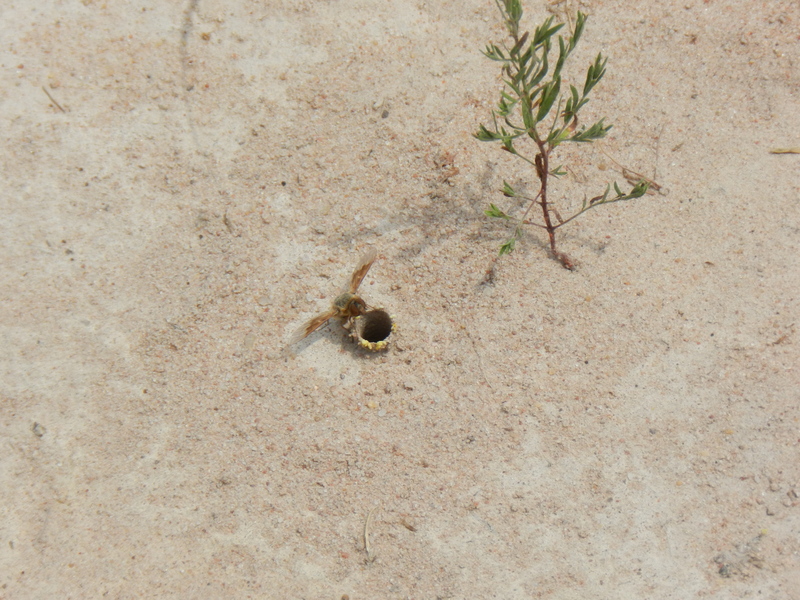 Once the female has chosen a nest, she sets up housekeeping and lays her eggs. This family laid five eggs most of which you can see below. Only the female sits on the nest and the male brings her food all throughout the day. She will only leave her nest about 6 times a day for water and such, much less often than other species of birds. Hatching begins after 14 days and all the eggs will be hatched out over a 24 hour period. “Mrs. Carolina” left her nest this morning just long enough to allow me to snap this picture of her new babies. If you click on the picture below and enlarge it, you can see they have very few feathers at this point and you can see the small bones inside the wing and the claws on the feet. Three of the five Carolina Wrens have hatched out just this morning; not many feathers on them yet. 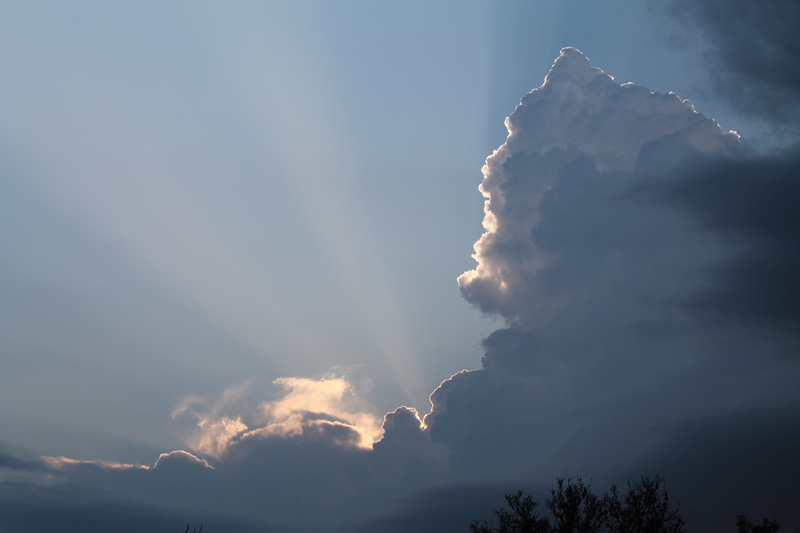 Photo by B.LaVergne, May 25, 2013. The male will continue to bring food to the female and new hatchlings until they are ready to leave the nest. The male is a busy bird! It’s been a real treasure to have the opportunity to watch this happen right on our front porch. So keep your eyes and ears open for the Carolina Wren. Hint: This is the spring time look — it is much different looking later on in the fall/winter. We will post the answer, along with the picture of its fall look later. Reply with your answers by sending in a “Comment” on this post.